Posted by C Y Gopinath in Food, Humor. C Y Gopinath discovers how to cook the delicious dish that killed the tender coconut tree but completely re-colonized his gut. Take a medium-sized banana. Chop the pseudostem finely and boil till tender. Spice it and eat while costive. My bowels nodded agreement, and that was how I first tried out Banana Tree Khich Khach, for want of a better name. You can get banana pseudostems in Matunga in Bombay or Karolbagh in Delhi. They look like pale white plastic plumbing pipes, shiny and smooth outside, and usually cut into one-foot segments. I dialled my mother in Chicago and asked her exactly how much a person should buy. She’s terrible with quantities, like all mothers, and she thought for a minute, while the dollars ticked by. Then she said, “About one-and- a-half talcum powder tins, to feed about five.” How perfect – a banana pseudostem does resemble a cylindrical talcum tin. Buy the banana pseudostem carefully. Check for discolorations – there should be none – and ensure that it is tender and white. Cutting it is an art best mastered through a little practice. Oil your hands, because the pseudostem exudes a sticky pseudo-goo that soap cannot touch. Peel away about two layers of the outer skin, about a centimetres depth, to expose the tender white rind within. This is the part you will cook and eat. Cut into discs about four millimetres thick and plop into water. My mother’s voice whispers that you should add about half a cup of sour buttermilk to that water, to prevent the stem from getting discolored. Finely chop the banana pseudostem. Pay attention to the lengths of ‘string’ that unwind as you cut. They should be assiduously removed and discarded. Pressure cook the banana pseudostem, with one cup tuvar dal, some turmeric and some salt. Combine this paste with the boiled banana pseudostem, add a little water if the result feels too thick, and then let the Khich Khach come to a boil over a slow fire. The banana pseudostem absorbs the various subtleties in the coconut paste, and emerges dressed for a party. Throw a half teaspoon of mustard seeds into hot oil. When it begins to pop, add a half teaspoon of urad dal. As the dal begins to turn a lovely golden color, add a few whole red chillies, just for a few moments, and then throw the whole thing over the dish as a garnish. It is now time to answer the question that has been distracting you. What, you are wondering, is the meaning of the word ‘costive’, mentioned so casually in the first paragraph. No, it is not another word for the price index, but simply means — oh, I couldn’t possibly. Go look it up, everyone has Google these days. If you’re too lazy for that, try eating a little Khich Khach. May I offer you some light tiffin? No? A cool drink then? What about a curd bath? It’s guaranteed to cool you off. According to the instructions in the third book of the Cook and See trilogy, the offer of a curd bath may fearlessly be made to Brahmin priests during certain auspicious days. The complete bath must include rice, buttermilk, sweet jaggery water, and a coconut chutney, among other things. Towels and soap are not mentioned. Before you leap to the conclusion that this blog has degenerated into bathroom humor, what with the lavage of priests and all, let me add that bath merely happens to be how the venerable Meenakshi Ammal spells bhath, meaning rice, in her three-part classic set, Samaithu Paar (or Cook and See). As any self-respecting Punjabi knows, curd-rice is what gives the average Madrasi his or her keen edge and legendary stamina. Similarly, both light tiffins and cool drinks are de rigueur when you are getting your daughted hitched to a suitable boy and the wedding guests are at the door. Page 162 of Book III goes further, offering a ‘List of Items Required for Preparing Food Etc’. In smaller type immediately below this are the words ‘For About One Thousand Persons’, followed by a list of 46 items that includes 12 kilos of coffee powder, 8 litres of ghee, 40 kilos of idli rice, and about 750 kilos of firewood. Trust me, this is valuable information, available nowhere else on the planet but in S. Meenakshi Ammal’s revered trilogy. Spoken as it would be in Tamil, samaithu paar is a disarming invitation to try your hand at some fun stuff in the South Indian kitchen, make a few mistakes, create a complete balls-up of in all but on the whole have a very good time doing it. 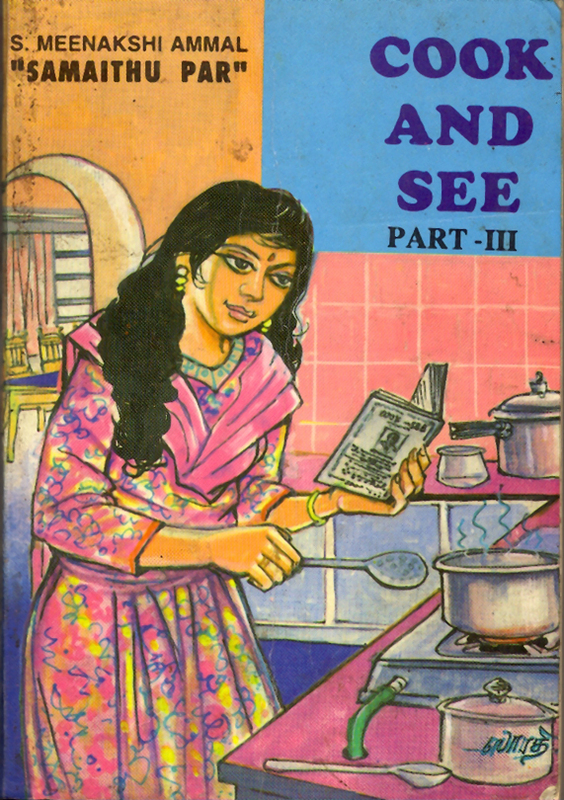 If you are wondering, as you should be by now, where cooking comes into what has so far sounded like a one-stop marriage manual, the answer is Books I, II and III. I doubt there is any recipe or procedure featuring any vegetable or grain you can name that will not be found somewhere in these two volumes, starting on page 1 with four different ways of making sambar, and going on to such obscure but crucial life skills as the method for grinding Australian wheat into flour, preparing a perfect cup of south Indian filter coffee, and how to beat rice flakes into submission. For the latter, there is the helpful tip that “when two people pound it simultaneously by alternate strokes, the flakes turn out better”. Samaithu Paar is simply the most authentic set of recipes I have ever seen on classic South Indian cooking. I was fortunate to find a fresh reprint at a Higginbothams book shop in Chennai. Amazingly, you will find its 1968 edition listed on amazon.com, but with a small line confessing that it is out of print. The single customer review there describes how indispensable it is to someone struggling to learn South Indian cuisine, even if navigating the book takes a little getting used to. The books look today as they doubtless did when they were first printed in 1951. S. Meenakshi Ammal’s writing has not been value-added by the pens of modern recipe-makers. The ingredients and the instructions are offered in unhelpfully blocky paragraphs, no effort made to separate ingredients into lines. The tone of voice is that of an older woman advising a younger and inexperienced one. And this, it turns out, is pretty much what Meenakshi Ammal set out to do. “. . . it was also a time when with the opening up of more opportunities for women and the dawning of the realization that education was for both sexes, a vast majority of girls were not able to find the time to learn cooking in the traditional way from one’s mother. This proved a problem subsequently when, after marriage, they had to build their own homes and manage their own kitchens. In was to address this need that the author with a lot of foresight, embarked on her venture to bring out a cookery book which would serve more as a manual for daily use”. Yes, I know. You want proof of the pudding. So here are three of my all-time favourites from her set. Not only are the recipes simplicity itself, but the spice mixtures I describe may be used for pretty much most other vegetables other than the ones I have described. Fry the spice ingredients in 4 tsps of oil to golden brown color, and grind to a coarse powder along with 1 1/2 teaspoonfuls of salt. Cook the whole potatoes in their jackets, and peel. Spread the spice powder on a board and place the potatoes on top of it. Press the potatoes with a roller to break them up. Keep breaking them up till the pieces are roughly the size of large marbles and thoroughly mixed with the powder. Serve with chappatis or rice, and sambar or dal. Heat a vessel with enough water to cover the arbis. When the water is boiling, add the arbis (washed and cleaned well) and cover with a lid. Turn it occasionally. When it is cooked, remove from the fire and peel. Cut each arbi into two or three pieces and keep aside. Roast the whole black pepper, cummin seeds (jeera) and black gram dhal (urad dal). Grind into a coarse powder. This is known as curryma powder. In a vessel, heat 4 teaspoonfuls of gingelly oil, and add a teaspoon of black mustard seeds. When they start spluttering, add the cut arbi pieces. Add about a teaspoon of salt and scald, turning frequently. Add the tamarind juice and boil till the raw smell of tamarind goes away. Add 1 to 2 teaspoons of curryma powder, curry leaves, and mix well. Keep cooking until the liquid has evaporated, and the arbis become a mass. Serve with rice and dhal, or sambar. And in closing, let me add that if some dedicated and selfless person were to take on the task of presenting the priceless recipes in Meenakshi Ammal’s books in a more user-friendly way with clear ingredient lists and instructions, and gorgeous drooly pictures as is the norm these days, on lovely glossy paper — why, I do believe there may be a modern classic here waiting to be lapped up. SMITH AND JONES GRIND GARLIC AT NASHIK. In case you think this is one of those phrases administered to suspected drunks to check their sobriety, it is not. Smith & Jones happened to be a brand of readymade garlic paste, one of latest products of ravenous, emerging giant India. I spied it on the mixes and spices shelf of one of the new breed of US-style self-service supermarkets in Mumbai. Picked it up at once, of course, attracted by the Victorian-style graphics, the words ‘Traditional English Style’ written below in a pennant. Was this one of the newest Indian-made Foreign Imports coming out of a collaboration between a spirited desi entrepreneur and some expansive expatriate? Would Smith & Jones together wipe out Bedekar and Parampara? Was this the future of garlic, to be smashed and bottled and sold in disguise? Did Englishmen, by the way, eat garlic? Did Britannia rule with waves of garlicky breath? Hmmm. I checked the fine print and discovered that Messrs. Smith and Jones operate out of a Nashik address, and instantly all was clear. Smith and Jones are probably the working names of some Sawant and Joglekar who have cannily realized that the future lies in garlic. Made me start thinking about CYG and garlic. Allium sativa had not been a part of my strictly Dravidian childhood. Encountering it in Calcutta and Delhi, where I was shaped from boy to proud manhood, I felt formal towards garlic, like a Japanese towards a Gujarati. Gainda Singh, cook at my college , was a romancer of garlic, but since he shone in all other respects, I, as head of the Canteen Committee, tolerated this aberration. When the corporate world tamed the garlic and bottled it as pearls, promising there would be no odour and yet the heart would glow with health, I checked that out. This is how garlic ought to be, I thought, unrecognizable, odourless, untastable, unseen. In brief, I was a garlic hater. I thought it behaved like the opposition in the lower House of Parliament, always disrupting proceedings. I was wrong on all counts and today I stand ready to face the music. The unforgettable Ishtiyaque Qureshi, ex-chef of the erstwhile Searock Hotel and later the Leela Kempinski, once fed me a kheer in which, I learnt later, the floating almond-like pods were really garlic. Garlic pudding! Aaaaargh. But it tasted somehow like a mild Lebanese paradise. “The trick is to subjugate the garlic by cooking it in milk long enough at the right temperature,” said Qureshi. In Cairo, a taxi-driver’s wife ground raw garlic and green chillies together with salt and lemon juice, sandiwched it in the mouth of a small fried aubergine and fed it to me with whole fried Cornish chicken and a pasta salad. The one hero of this warrior-like meal was, believe it or not, the garlic. Though my conviction that garlic was garlic was on the wane, for many years I maintained that it was best consumed in pearl form. Lest your social life take a plunge, you know. But as of October 17, I have changed forever the way I perceive garlic. In large measure, this is because of a simple soup that was created by my wife Shilpa one sunset when no one felt like cooking and the evening stretched like eternity ahead of us. She threw a dart, it hit a Mexican cookbook, and another dart found page 72, Toasted Garlic Soup, serves 4 to 6. She ignored me. A woman who loves garlic knows what she wants. I watched as she took a fistful of more garlic than I would have eaten in a month of Sundays, and toasted them. The aroma, forbidden and strong, filled the house. The child began to wheeze. The domestic help began muttering about paid leave. Then the vapours settled and more disciplined, suddenly more exciting, grew out of it. More things happened. I watched, face buried in my hands, nose twitching. An hour later, I was tasting one of the most rogueish, ill-mannered and utterly charismatic soups I have eaten in a long time. To get the entire recipe free of charge, all you have to do is click on the Bloggers Choice Award website link on top of this page and, only if you believe with all your heart that Gopium deserves one more vote, go and cast your vote. On second thoughts, vote anyway. Who cares what you really believe in your heart? 1. Heat the oil in a large skillet until it is smoking. Add the garlic and stir over medium-high heat for a minute or so until the garlic cloves are lightly toasted. Transfer the garlic to a large soup pot. 2. Add as many slices of the bread to the skillet as will fit in one uncrowded layer. Fry over medium heat for a minute, turning once, until they are lightly golden on each side. Transfer to paper towels to drain. Continue until all the bread has been fried, and set aside. 3. Place the chilli peppers and tomatoes in the skillet and stir over medium high heat for a minute until they wilt. Transfer to the soup pot with the garlic. Add the stock and the salt, bring to a boil and simmer for 20 minutes, or until the garlic has softened. 4. Ladle the soup into individual bowls. Garnish each bowl with fried bread and a dollop of cream. Serve right away, piping hot. FROM THE DARKNESS OF KOLKATA’S LAKE GARDENS come the sounds of lovers holding hands. Bet you’ve never heard the sound of lovers holding hands before, but I have. It’s not the usual slurps and slobs and chwoops and fevered whisperings, but more a steady chomp-chomp-chomp. Occasionally you might hear an intense burp. It is the sound of two people deeply in love eating Calcutta’s jhalmuri together. No other city serves up this amazing snack based on puffed rice, or muri. The jhal refers to the fiery trail it blazes as it enters your system. Calcuttans buy their jhalmuri from numerous itinerant vendors who emerge towards twilight, with wicker baskets full of muri hanging from their waists. Arrayed around the basket like bullets in a carabinier’s magazine are old tins of ingredients such as rock salt, onions, green chillies and so on. If you took a closer look, you would find at hand a large Dalda tin as well, defaced and blackened, almost tired, in which he will combine the ingredients; and the small wooden baton with which he will give the mixture a twirl before serving it in paper cones rolled from old copies of Ananda Bazar Patrika. Bengalis will swear that there is something almost magical about the old tin which imparts a fire-tinged magic to the jhalmuri and explains why home-made version can never match what lovers munch at Lake Gardens. In the lane that runs by The Statesman building in Chowringhee, a gloomy hole-in-the-wall dispenses jhalmuri and nothing else. We used to despatch the office boy on late-work evenings to pick up jhalmuri. Putting aside crowquill and Rotring, we would shovel fistfuls of the stuff into our mouths, cursing at the fieriness of it and wiping the tears from our eyes. Work would be impossible later anyway, so we’d retire to some nearby beer bar and discuss the future of communism in Bengal. Because it is based on puffed rice, you might mistakenly conclude that jhalmuri is probably a cousin of Bombay’s bhelpuri, but the truth couldn’t be further. If puffed rice is the gene pool, then jhalmuri is the warrior and bhelpuri the poet. The biggest mistake you could make would be to try and adapt jhalmuri to local taste, for that would not be murder, it would be assassination. I spoke to several people, some of them Bengali, others with Bengal in their blood, to piece together the recipe for jhalmuri. Everyone remembered different ingredients, and I conclude that jhalmuri’s recipe itself must be variable. Accordingly, the recipe I give below lists the basic ingredients, and separately, a couple of add-ons. My only caution to anyone experimenting with other add-ons is to remember that a fine line divides jhalmuri from other puffed rice preparations. On no account should you try to sweeten it, using tamarind water and the like, for that would bring it too close to the Maharashtrian counterpart. Similarly, do not add any ground spices such as aamchoor (dried mango powder) or garam masala — you might get interesting tastes but none of them will be the real thing. Also, do note the casually used phrase ‘freshly pressed mustard oil’. Not only is this darker and more aromatic than the refined and packaged version, but it gives teeth to the jhalmuri plus it is what Calcutta’s muriwallas use. Whatever you do, do not, repeat, do not substitute mustard oil with any other oil except at your own peril. You’re ready now. Bung the ingredients into an old magic tin and give it a good twirl with a wooden spoon. Squeeze some lime juice over it. Walk into a cosy dark spot with someone you love deeply, and start eating jhalmuri, occasionally holding hands or burping. It was a humid day, the sort that dampens all urges towards food. I was sitting in my clinic, toying desultorily with some listless peanuts, when I sensed that someone was watching me. For a few years now — in fact, ever since parsley and iceberg lettuce began appearing in the local market — I have been running a small but successful practice counseling various culinary items who felt their identity threatened by the influx of Chinese, Italian, Lebanese, and Mughlai cuisines into India. My regular clients today include aloo chops wondering about the meaning of life after the MacAloo Tikkis; vermicelli upmas intimidated by chow mein; puri-bhaji that have been told that the railway platform now belongs to burgers; and others such paranoid entrées. I once had to make peace between some cloud-ear mushroom and a cabbage who feared displacement. This particular evening, as the nation raced towards the millennium, I was certain I was being watched. I turned around, ostensibly to knock the ash out of my meerschaum, and casually glanced up. There it was. An unprepossessing uttappam about 10 inches across, it surface flecked with a few cowardly onion flakes. “Ahem,” it cleared its throat. “I was wondering if you could help me.” I said nothing. “It’s about the pizza,” it continued. “What about the pizza?” I asked. In the meantime, atrocities were being committed upon the uttappam’s cousin, the dosai. The Dosa Manchurian was invented in a small tattukada in Cochin, in which the dosai was made to hold its own weight in chow mein, instead of the usual warm spiced potato mash. Indeed, every conceivable filling and covering was being indiscriminately inflicted upon the dosa — from heron’s egg omelettes to prawn malabari to chicken dopiaza to vegetable stew. The dosai was so crushed by these assaults that it surrendered its identity meekly. Even Chinese cuisine, once Chinese, latterly Indian, and now victim of the Indian cook’s attempt to please all and sundry, was being mauled. In a small eatery in Mumbai, I had myself tasted the Chow Mein Manchurian Mussallam, in which finally the mainland meets the hinterland in a clashing war of opposite tastes. All lose, only the cash register wins. I had beheld horrified the dawn of the Hakka Afghani, the Tandoori Croissant, the Amritsari Upma, with chunks of Reshmi Kebab in it. I even understood why it was going on. This country could not stand globalisation. The Indian abroad hides behind papads and garam masala. The Indian at home carefully checks the ‘imported’ dishes coming in through Immigration, and then cleverly renders them insignificant by ‘adapting’ them. The adaptation process is simplicity itself — he must sprinkle garam masala over it, substitute ghee for olive oil, rev up the red spices a little and sprinkle the dish with coriander just before serving. The pizza thus vandalised could be fashionably re-named La Pizza Indiana, and be hailed as a triumph of thinking global but acting local. “And I? What will I be?” whined the uttappam. In a clear case of judicio-culinary activism, C Y Gopinath is put on trial for declaring Rama Nayak’s wafers to be the best in the universe as we know it. Yes, M’lud, I am reasonably certain that it was not an Indoor Locker. Or Indoor Laukar, as they tell me its erroneously called in the teeming wholesale veggie markets of downtown Maharashtra. Or Indore Locker, for all I know. In fact, Your Grace, your best money won’t get you a decent Indore Locker till after Christmas is gone and you’ve rung the new year in. After that, it’s Indore Locker season all the way till May, with the occasional Talegaon showing up. But if it’s December — and it will soon be — then the potato of choice for frying wafers is not the Indore Locker or the Talegaon but the Mahabaleshwar potato. And I stand guilty as accused of having declared, in a public place and in a loud voice, that the wafers made at Rama Nayak’s 50-years-plus Udipi Hotel, just outside Matunga East station, deploying the magnificent Mahabaleshwar, are the best in this quarter of the universe. Or at least the Asia-Pacific rim. All I ask, before this august court sentences me to a lifetime of dry dum aloo with no spices, is a chance to defend myself. The problem, Your Excellency, is that you’ve never held a Rama Nayak potato wafer between your grubby judiciary fingers, else you wouldn’t be trying me for nepotism. It’s really very thin, you know. Wafer-thin would be the exact phrase that’s eluding me. Hold it up against the sun, and God will shine a light through it, coming out all translucent and glorious on the other side. In color, it will be a uniform pale gold, though the occasional one will be streaked with a reddening that got past quality control. Pop one in your mouth and close your eyes as you chew. It’ll crumble all crisp, like the credits of some modern movie, releasing only texture and a fleeting certainty that nothing is wrong with the world at the moment. The feeling disappears in an instant along with the wafer, but if you want it back just pop the next one in your mouth. They come in packets of Rs.20 each, Your Rectitude. They are not vacuum sealed or foil packed. And they are completely touched by human hands every little inch of the way. One the day that I took it upon myself to personally inspect the wafer-making process at Rama Nayak, the human hands in question belonged, respectively, to Ratnakar, potato peeler from Kundapur, South Canara; Uday, potato slicer from Bhatkal, on the border between South and North Canara; and Ramaiah, deep fryer from Tirunelveli, Tamil Nadu. It is nearly a religious experience, Your Wittiness, watching wafers being made. The Mahabaleshwar is a sturdy, soldierly potato with a parched-earth tracery on its red-brown skin. Early in the morning, Satish Rama Nayak, who runs the show, or his nephew-in-training Pravin Kumar, will already have chosen the best Mahabaleshwars in the market, going by shapeliness, girth, and absence of sprouting eyes and discolorations. Starch is enemy number one in Waferland. It makes the wafers stick to each other, it absorbs oil, it creates grease and glaze, and it causes, eventually, cardiac arrest in loyal customers. After being peeled, Rama Nayak’s Mahabaleshwars are dunked in cold water for two starch-sucking hours. Then, after Uday the potato-slicer has done his stuff, they do two more hours in a metal tub, where they float pale white and luminous like dream flakes. This water will presently grow milky with starch, while the wafer, losing weight, gains a certain formal bearing. And it’s ready to boogie. It will not have escaped your sharp notice, Your Perspicacity, that potatoes start cooking at 113°C but brown at 188°C. It might, however, never have crossed your fine sub judice mind to ask how on earth they measure temperature in a 50-year-old Udipi kitchen without thermometers? I’ll tell you, m’lud. The deep-fryer from Tirunelveli sprinkles a little water on the oil. If it merely crackles unhappily, then the oil isn’t hot enough. If, instead, it shatters the airwaves with a resounding whipcrack, then it is ready to host the Mahabaleshwars. Into the wok they go. There is a celebratory effervescence as the wafers begin to surrender their remaining water. Then, for exactly three minutes, they jostle around happily like tourists in a 5-star jacuzzi, getting their hides lightly tanned. They out they come. The surface oil drips away into a colander. Ceiling fans are switched off lest the wafer start losing confidence. There is a light summer shower of salt, sometimes red chilly powder as well. And Ratnakar the potato-peeler turns into Ratnakar, wafer-packer. Does about 60 packets a day. No bulk orders accepted, now or ever. Your Pulchritude, I’m all admiration for your gush of judicio-culinary activism, pressing charges against a harmless wafer fetishist like myself just because I feel kindly towards Rama Nayak’s wafers, but do you really have a case? Here, try one of these. Want another? Go for it. What about this spiced one? Don’t close your eyes, Your Magnitude. Concentrate on the accused. You have a case to judge. And you should really stop this injudicious slurping. And don’t speak with your mouth full. There was silence in the conference room. Though the new millennium was well under way, the temperature outside had not changed; it remained –26°C. The heating system was yet to be installed, so it was shivering cold inside as well. The only one unaffected seemed to be the shaggy horse on which the Manchurian Premier had arrived; it now stood in a corner of the room, attacking fodder while snorting and farting by turns. Other than the Premier, there were also his three military chiefs, his Press Advisor and the Minister for Foreign Affairs, who had built up the case against India. At the far end of the table, leering openly, sat the Indian delegate, MLA Ram Lakhan. He drew himself up to his feet, emitted some paan into his portable paandaan, and spoke up now in his country’s defense. “A complete fabrication!” said the Minister for Foreign Affairs. “Let the Indian delegate explain how I have seen the so-called Gobi Manchurian served only at labeled Chinese restaurants all over India?” As Exhibits A, B and C, the Minister now placed some quite cold and congealed specimens of Gobi Manchurian gathered from restaurants in Tangra (Calcutta), Colaba (Mumbai) and Ludhiana (Punjab). The Minister for Foreign Affairs withdrew Exhibit D, the signboard of a shop that had recently come up in Girgaum, Mumbai, for a multi-cuisine restaurant called simply Buckingham Palace. All kinds of Mughlai, South Indian, Punjabi and Chinese food available. There was a silence. “Then why bring Manchuria into it?” asked the Premier gently. Historians note that in the decades that followed Manchuria avenged themselves by launching Sambar Cantonese (featuring hoisin sauce instead of tamarind and five-spice powder instead of chaunk ); the Beijing Baingan Bahar (in which the aubergines are buried for six years before being cooked and eaten), the Soy Bean Masala Lassi; and finally the Ming Biriyani, cooked in the purged stomach of a Chinese running dog of capitalism for five hours. The Indian MLA, history has it, went back and victoriously reported to his masters that Indian cuisine had once again expanded its frontiers and invaded Manchuria as well. This meant that I was being invited to check out some free food at a 5-star hotel, you understand. On such matters as pre-paid gifts from corporations, or sponsored junkets to foreign countries, I have always followed a strict policy of reluctant acceptance in a Marxist frame of mind, which means that I say yes, infiltrate the system and destroy it from within. I was right. There was nothing worth writing about. There was an unremarkable mackerel which I could not even eat. There was a very good warm seafood salad, but it fell short of Gopium norms of exoticity. There was an excellent bream, stuffed with sundry things, I got the head, my companion got the tail, both were outstanding, but the item was too complicated for the average but avid cooking enthusiast. This was when I addressed the Sous Chef, a young, faintly Gallic-looking fellow, and explained about Foodophilia. The Sous Chef, who had been forced by Saddam Hussein to leave his job with an Oberoi hotel in Iraq and return to India, was personally in charge of SeaRock’s Seafood Festival, and was evolving quite a few unfettered combinations by mixing old ingredients with new ideas. 1. Take a large fillet of bekti, trim sides and belly area. Slice thin, by cutting across the fillet at a slant with a very sharp knife. Marinate the slices in lime juice, salt and pepper, and keep in a fridge. 2. To prepare the stuffing, clean, de-vein and wash the fresh prawns, and then mince them. Chop two large onions fine, and peel and chop the garlic pods. Wash and chop the dill and the coriander leaves. Blanche the spinach leaves and refresh them in chilled water. Cut the tomatoes into quarters and discard the pulp, and cut the flesh into small pieces. Grate the cheese finely and mash with your bare hands, and then roll them into thick ‘straws’ by rolling them between your palms. 3. Heat the butter in a pan and bung in the ajwain. Add the chopped garlic after a few seconds, and finally the chopped onions, which should be sauteéd till they turn transparent (or for three minutes, whichever comes first). 4. Now add the minced prawns and mince and sauté lightly, making sure the juices do not run out. Add salt to taste, remove from flame and keep aside. When it has cooled, add the chopped coriander and tomato pieces, and mix. Divide the stuffing into eight equal parts. 5. Take a slice of bekti and put two leaves of blanched spinach on it so as to cover it. Spoon some of the prawn mince onto this, and place a ‘straw’ of cheese in its centre. Roll it up — fish, spinach, prawn, cheese and all — wrap it in cling film or silver foil, and twist the ends together like a toffee. After cooling it in a fridge for a while, poach the paupiette in the fish stock. 6. To prepare the sauce, pureé some grated coconut, strain to recover the cream, and keep aside. Melt butter, add flour and cook for three minutes or so, till the aromas of cooked flour are released. Add the cream, and the lemon grass blades, and simmer for two minutes. Add the saffron strands. Once the mixture acquires the saffron colour, add the coconut cream, bring to a boil, and then simmer gently for two minutes. Strain. 7. To assemble, pour the sauce on to a heated plate, cut at a slant and arrange the paupiettes in the sauce. Between the fish pieces, sprinkle the finely chopped coriander coriander. Carrots and cucumbers may be arranged on the plate, says the Sous Chef, as vegetables-in-waiting. I am not going to reveal to you the recipe for Fillet of Sole Rothschilde, also a creation of this amazing Sous Chef. My reasons for this are natural reticence, a strong perverse streak, and an amazing shortage of bandwidth. ONE DAY, APPUSWAMY, CHOPRA, SMITH AND BEAUVILLIERS finally met to thrash out a matter that had been troubling serious cooks all over the world: what was the correct recipe for the world-famous Indian curry? Each was a curry expert in his own right, and each disagreed vehemently with the other three. Appuswamy staunchly maintained that the only place on earth where real curry was South India, and that it was spelt cari. Chopra claimed that it was actually spelt kadhi, and was a delicious preparation featuring spongy chickpea flour dumplings in a buttermilk-based gravy. Smith, who claimed it was his real name, said that England had countless Indian curry restaurants, adding that he had eaten in them all. “At least one of them must be serving genuine Indian curry,” he argued. Beauvilliers would generally burp and hold his peace, as though what he knew could not be shared with commoners. “But old fruit,” said Smith patronisingly and with galling logic, “how could you possibly not have it? It says right here in big letters ‘MADRAS’ — so it stands to reason that it must have come from Madras. N’est-ce pas, old frog?” The last line was addressed to the lofty Frenchman. I stopped. Clearly this was a circular definition. According to this, anything cooked in India or by an Indian or with Indian spices could be called curry. Curry was all things to all people. Everybody wins. He proceeded to detail the official recipe for Indian curry: 34 gm tamarind, 44 gm onion, 20 gm coriander, 5 gm chilli pepper, 3 gm turmeric, 2 gm cummin, 3 gm fenugreek, 2 gm pepper and 2 gm mustard. “Zat ees what we in the west call curry powder,” said Beauvilliers, with a fey flourish. With that, India’s least known contribution to western cuisine, disappeared from our land forever. Appuswamy, shocked out of his Dravidian wits, sat stunned. WHAT DID GOOD SOUTH INDIAN PANDIYA KINGS do on full moon nights in April? According to an unusually reliable source, they would take their wives and children to the riverside and have a great old picnic. While the moon grew fulgent and gravid in the sky, they would entertain themselves in kingly ways, singing old kingly Pandiya songs, telling Pandiya tales of valour and conquest, and finally, in a frenzy of Pandiya hunger, eat some royal Pandiya food. This royal picnic fare, whose precise cooking details have just reached me, would have been prepared to exacting specifications earlier that April day. Because it would almost certainly be quite cold, or at least tepid, by the time it was dished out, it had to be conceived so as to be quite delicious even when cold. Because of the unelectrified lunar light it would be served by, the food had to be independent of visual appeal. It had to be dry and gravy-free but should not render royal gullets arid during its passage. It should not require consumption in any particular order, nor call for any particular accompanying dish. Finally, it should please a king. The cuisine that met all these criteria was called chitrannam, and carried to the riverside during the month of Chitra (14 March to 15 April) on the day of Chitra Purnima (which, by the way, just passed us all by on 15 April). As I write this, the next full moon is on 15 May, and that too will be a thing of the past by the time you read this. However, 14 June is not far. Chitrannam is made entirely from rice. The things Pandiyas did to glorify rice, without recourse to a single vegetable or meat, surpass the merely amazing. A typical Pandiya picnic hamper might have included tamarind rice, lemon rice, coconut rice, sesame rice, mango rice and curd rice (and, of course, some payasam or kheer to sweeten the aftermath). In addition, there would have been papads, and perhaps pickles. I had best get down to details now, as each rice is slightly different in its preparation. The basic chitrannam is boiled rice with a certain garnish. However, because the garnish varies marginally between the recipes, you have to prepare each rice separately. Also, the red chillies in the garnish merely add pungency, so do modulate their quantity according to taste. Below, I furnish the recipe for the basic garnish; with each recipe, I will indicate the ingredients that must be left out or added to the garnish. Finally, there will be the special ingredient — lemon, sesame, coconut and so on— that will distinguish the rice. Of the six recipes, tamarind rice is unique in requiring a special gravy to be prepared in advance, so I have provided this recipe last of all. Boil the rice, and let it cool a bit. Add the curry leaves, salt and oil, and mix it into the rice with a wooden spoon. Break it into roughly six parts and keep aside. Heat the oil, and then throw in the mustard seeds, chick peas and urad. When the mustard begins to crackle, add the curry leaves, red chillies (and any additional ingredients as indicated with each recipe). Stir the mixture for a while, and then add the rice. Salt to taste. Mix it all together well with a wooden spoon. This garnish must be prepared afresh for each recipe below; certain additions and subtractions must be observed as indicated. Prepare the garnish, throw in the rice, stir awhile. Remove from the fire, and add the lemon juice. Mix well. Prepare the garnish, and keep stirring till the grated coconut and the cashew nuts begin to brown a little. Throw in the rice, stir awhile. Remove from the fire, mix well, and keep aside. Prepare the garnish, and when it is ready, throw in the rice. Stir awhile. Sprinkle the sesame-red chillies powder. Remove from the fire, mix well, and keep aside. Fry the mango shreds in hot oil for about 2 minutes, and then keep aside. Prepare the garnish, and when it is ready, throw in the rice. Stir awhile. Sprinkle the fried raw mango bits. Remove from the fire, mix well, and keep aside. Soak the tamarind in warm water for about five minutes, and then squeeze out the juice. Keep it aside. Prepare the garnish as described above, including the peanuts and methi with the other ingredients of the garnish. Add the tamarind water, and salt to taste. Simmer the mixture till it thickens somewhat. Sprinkle the sesame seeds powder over the thickened tamarind gravy. Add the boiled rice to the tamarind gravy, mix well with a wooden spoon, and keep aside. I have early childhood memories of chitrannam, though we called it a vennila picnic — or White Moon Picnic — because it was not the month of chitra and besides, we were not Pandiyas. Only once was the venue faintly reminiscent of a river. We rented a boat at Delhi’s Boat Club lawns and rowed down the man-made waterway just about wide enough to catch a full moon’s reflection. An uncle rowed, his ebony biceps rippling, and my mother served that wonderful food. Bats flitted about peacefully, night owls chuckled, and we yawed and pitched gently, eating, eating, eating. ONCE UPON A TIME, long ago, in the enchanted part of India known as the Backwaters, there lived a simple villager named Mohan. Thin but wiry, with jet black hair and intense eyes, Mohan had one great passion — cooking. It was widely acknowledged (or at least undisputed in the stretch of the Backwaters where the Onam Boat Race is held annually) that when it came to wizardry in the kitchen, there was nothing even Mohan’s mother could have taught him. Whenever there were visitors to his part of the waters, Mohan would brusquely shoo away the womenfolk and take over their kitchen. The women, who knew they would never be a match for Mohan, would outwardly mutter and groan and feign inconvenience as they left. Later, after he had conjured up a perfectly magical feast, Mohan would summon them to serve the food. He himself would modestly retire to a vantage behind some coconut tree, probably to study the expressions on his guests’ faces as they ate. The thing that I do not know about Mohan is whether he was capable of cooking up recipes in his head as well as in the kitchen. Some cooks are like that, you know. They can effortlessly imagine into existence a dish that perhaps no-one could possibly ever make. And this is why today, nearly six years after I met Mohan, I still do not know if the Syrian Christian Coconut is for real or something Mohan dreamed up to make me smile as I left Allepey. It was a film shoot. It was a hot and humid day, with bright, clear sunlight and sweat glinting on foreheads and knuckles of the unit members. Lunch, when it was finally served on plantain leaves in a shady backyard, was a welcome break. As the women bustled about, tittering courteously and serving, I began to wonder who among them had created such amazing food. There was a dish featuring mussels and yams in a coconut gravy; another featuring jackfruit and tiger prawns; a sort of spicy sambar; crisp fried tapioca wafers. And that was when Mahesh Mathai, the film’s director, introduced me to his friend Mohan. Mohan spoke no English, and I barely understand Malayalam, but when people are united by affection for the craft of good cooking, words hardly pose a barrier. In the boat on the way back to Cochin, I used an interpreter to probe Mohan’s love of cooking. His answers, it seemed to me, were somewhat distracted, as though he had some more urgent mission. Suddenly he asked me: “Shall I tell you about the Syrian Christian Coconut?” And that was how it unfolded. Once a year (said Mohan), just after the paddy harvest, certain families of land-owning Syrian Christians go through the ceremony of parboiling the rice in ancient stone vats in their backyards. During the several hours that the grain boils, they take advantage of the extreme heat within the vats to have a brief and passionate extra-marital affair with the coconut. The result is an exotic, lyrical dessert that you will be lucky to find only once a year, provided you are in the right Syrian Christian home at the right time. The coconut should be well-chosen, neither so tender that the inner flesh is pulpy and loose, nor so mature that the white has hardened into a shell. Once such coconuts have been selected, a slice is neatly removed from the top, and the sweet water drained through the opening. Each coconut is now stuffed with a delicious mixture featuring flattened rice (pohe in Mumbai, aval in Kerala), jaggery, a few cardamom pods, some jeera and a spoon of clarified butter). The coconut’s lid is now replaced, and the entire gizmo is bound up tightly with cloth — and tossed into the vat where the rice is boiling. Here, in the intense heat of the cauldron, the treasure within the coconut is transformed by a process that is neither boiling nor baking nor entirely pressure cooking nor anything else. For a few hours, the coconut dances about in the water, like an impatient egg in an incubator. When the rice is finally parboiled, the coconut too is all set to deliver. If you’ve done it right, according to Mohan, then you should be able to tear away the outer husk of the coconut, which would have tuned loose and fibrous. Sitting within it like a nearly perfect pearl, should be a hot, white ball filled with a heavenly sweetness. Through the hole in the top, you’d probably get wafts of cardamom, cumin and butter. You merely let it cool, and then serve it. Mohan disappeared into Kerala’s dusk, and I never met him again. Back in Mumbai, I valiantly tried to recreate the Syrian Christian Coconut at a friend’s house, using a pressure cooker instead of a stone vat, but all I got was a misshapen pulp and a demolished coconut. Since then, I have collared many a Syrian Christian and asked them to tell me yea or nay about the Syrian Christian Coconut. They have all heard me out patiently; some have shaken their heads sadly; others have smiled tolerantly. They didn’t say it, but I could tell they thought I was nuts. ISHTIYAQUE QURESHI CONTROLS FOOD. The way a pet-lover controls his pet. If he doesn’t want his onions to brown just yet, they will patiently await his further instructions. If he wants the meat not to stick to the bottom of the pan, then the meat will obediently float around in its oil, sticking not even to its closest friends. If he wants the garlic to go to sleep, it will go to sleep, pretending it’s actually an almond. To understand which djinn gave Ishtiyaque his awesome powers, you must go both into his genes and genesis. Genes first. Ishtiyaque’s father, Imtiaz, was already a legend in the gullies of Lucknow before he was discovered by the Maurya Hotel group. In those bylanes, he had improved his own mastery of ingredients and proven his mettle in simple, nearly impossible feats — such as mixing sugar into rice. The accolade went to him who could mixing the largest quantity of sugar into cooking rice without sacrificing the flakiness of the final product. Imtiaz, the story goes, could effortlessly blend 3 kilos of sugar into a kilo of rice. The architect of the famous Dum Phukt Restaurant — whose Bombay edition closed down after a bomb blasted the Searock Hotel — was hailed, on the inside flap of the menu, as being illiterate and unschooled, but that was wrong. Imtiaz’s studies were more precise than most engineers’ and more sophisticated than most artists’. And it was this extraordinary skill of mastery over the cooking process that he passed on to his eldest son Ishtiyaque, who never thought he’d one day be a virtuoso in a kitchen. I asked to meet him after tasting his butter-like, utterly yielding kakori kebab, revived from the dhabas of Uttar Pradesh. As our acquaintance grew, I was privileged and delighted to be his guinea pig in a number of experiments. In one, he served me what seemed like an almond kheer, except that the ‘almonds’ were pods of garlic whose ego he’d subjugated by careful ministrations in simmering milk, converting them in the process into something quite nawabi and aristocratic. On another occasion, he satisfied a picky vegetarian companion of mine with a stupendous biriyani which she promptly labelled a sham. But it was not. The ‘meat chunks’ were blocks of jackfruit, cooked so that their texture, taste and consistency was indistinguishable from mutton. The third time, at the Leela Kempinski’s Indian Harvest, Ishtiyaque decided to experiment with morrels, the exotic and costly mushroom-like fungus that is so prized in French cuisine. He delivered an array of delicacies to our table, all Indian as they could be in taste, yet ineffably refined by the subtlety of morrels. Now for the genesis. Ishtiyaque is one of the few unsung heroes of the Indian kitchen. He’s the maestro who will never be the witty host of his own food show on Star TV, the chef who will never write his You-Too-Cook-Be-Like-Me best-seller. In fact, this extraordinary artist shuttles around in the twilight zone between the cooking and the food processing industry. He disappeared for a spell to Bangalore, exploring the frigid world of frozen kebabs and biriyanis. Then, tiring of that, he re-entered normal life at the Leela Kempinski in Mumbai. Then there was another disappearance to Ahmedabad, another disenchantment, and another homecoming. You may see him today triumphantly re-inventing one of Mumbai’s most illustrious Mughlai restaurants. The Bandra edition of the Copper Chimney, renamed the Charcoal Grill, is currently a showcase of Ishtiyaque’s talents. He made his olivon ka biriyani in my humble kitchen. In contrast to my panic-driven method of putting together my merely passable meals, Ishtiyaque cooks as though he had all the time in the world. The onions will not char while he turns away from them to play with my son. The meat will not separate into fibres because he was busy pounding garlic for the raita. With Ishtiyaque, cooking is an act of will, man against masalas, and the winner is always the same. “But olives in a biriyani!” I exclaimed. Spain meeting Hyderabad, bullfights in the haveli, torreros and tandooris. How could they mix? Ishtiyaque smiles. And that reminds me: until someone imported potatoes into India from South America, whoever had heard of batata wadas here? 1. Wash the rice clean in several changes of water, and soak it water until needed. 2. Heat ghee on a low fire, and brown the onion rings in it, stirring frequently until they are golden brown and crisp. Use a slotted spoon to drain the oil off the onions. 3. If you are planning to use soya bean nuggets, fry them light golden in a little oil, and keep aside. 4. To the same ghee, add the crushed garlic, bay leaves, big cardamoms, green chillies, ginger, and half a cup of water. Sauté for about three minutes. If you are using soya bean nuggets, add them now, and then add a litre of cold water, or enough to cover the rice. When the water comes to a boil, add the soaked rice and salt to taste. 5. When the water comes to the boil again, add the pitted olives, mint and saffron and stir it gently. 6. Using the dough, seal the rim of the cooking vessel and place the lid firmly against it. Put the vessel on a tava and let it cook on slow heat. When the steam begins hissing out through a weak spot in the dough, the pulao should be ready. If it is not, add a little more hot water, reseal the vessel, and let it cook a little longer. 7. When the pulao is done, garnish with the crisp fried onions, sprinkle with garam masala, and serve hot, along with a little raita. YOU SURELY KNOW THE STORY of the poor, deluded cauliflower. He tried to join the World Wrestling Federation, but was rejected on account of his ridiculous assertion that he should be treated as equal to beef. Claimed that though he had been plucked fresh from a vegetable patch, he had the soul of tenderloin. This explains his current identity crisis. He feels macho yet curiously out of place when they marinate him in tandoori masalas and cook him along with seekhs and reshmis. On the other hand, he feels embarrassed but oddly at ease in a salad in the tittering company of baby corn and snow peas, all dressed in olive oil. Most of all, the cauliflower is realising that without some cosmetic intervention — either complete immersion in some fancy French sauce or lots of garam masala — he will never be one of the boys. And this must be one of the reasons why cauliflowers, in season or out of it, are specially fond of Suman Bakshi neé Hattikudur, Mangalorean by heritage, Kashmiri by marriage, Mumbaiya by upbringing, a lady from neither here nor there and therefore at home everywhere, but particularly in her kitchen, where she casually re-incarnates old dishes into riveting new avatars. For example, she’d added something devilish and tart to the cauliflower dish which I had christened Caulifornia after just one sampling. “Aamchoor?” I asked expertly, but she shook her head. Then what? Tamarind? Surely not. What was it? Suman ignored the question. I first tasted Caulifornia some months ago out of a lunch box Suman had packed for her husband Jayant Bakshi. Now JB is not only is taller than Godzilla, but he comes from Kashmir and is a perfectionist who makes perfectly round chappatis. Which even Suman can’t do. I knew, with my first mouthful of Caulifornia, that the phool gobi had finally become a somebody. An Oscar nomination was on its way. I called up Suman and asked her whether she could make the dish for me. No. But I remembered seeing bits of green leaves. Definitely not red. Maybe no red chilly powder. We couldn’t reach consensus on which cauliflower version had captivated me that day months ago, so Suman put together two entire cauliflower entreés, just in case. In the second one, the cauliflower is pressure cooked whole, immersed upto its ankles in a mesmerising tomato gravy. I named that dish Don Cauleone, but that was definitely not the cauliflower of my dreams. That honour went to Caulifornia. Caulifornia is not a quickie dish. It has Kashmiri touches, such as the soont (dried ginger powder) and saunf (aniseed) powder. It also has a tangle of spices, with a little bit of everything — or so it would seem. But it is my considered insight that the trick is in the ginger and aniseed powders, the Kasuri Methi, and the browning of the cauliflower before the show starts. If you try it at home, and you should, then do remember that it connects outstandingly with hot chappatis and some plain, garnish-free masoor or tuvar dal. Suman looked distinctly uneasy. You see, she understands the cauliflower’s predicament: he hates dressing up. He likes to be seen with the boys, do the manly thing, even though he feels more at ease with the ladies in the beauty parlour. And now here Suman had dressed him up in saunf and dried ginger powder and made a proper parlour queen out of him. This is why, I now believe, in a fit of utter thoughtfulness, she tossed in a full teaspoonful of Dijon mustard paste along with the dried spices. And thus converted the cauliflower from being a low, limp-wristed cousin of the cabbage to sheer majestic royalty. 1. Choose a fresh, firm cauliflower with crisp green leaves. Keep the leaves aside after washing them thoroughly. Cut the cauliflower into big flowers, including about an inch of the stem with each flower). Wash thoroughly and then soak in salt water for about 15 minutes to flush out worms, if any. 2. Heat oil about an inch deep in a frying pan, and deep fry the cauliflower until they turn lightly golden. Place them on kitchen paper to drain the oil thoroughly. If you are using cauliflower leaves, fry them separately for a few seconds in the same oil. 3. Cut the paneer into squares of 1.5 inches and 1/4” thickness. Fry them briefly in very hot oil, until they begin turning light brown. Remove them with a slotted spoon, letting the oil drain out, and keep them in a bowl of cool water. 4. Heat half a cup of vegetable oil in a kadai. When the oil is very hot, add the hing. After a few seconds, add the finely shredded ginger, stir briefly, and then add the jeera (seeds). As they begin browning lightly, add the green chillies. Mix the curds in, and stir briskly till all the moisture has been absorbed. 5. Add half a cup of water and cook for about 2 minutes on a medium fire. Add the cauliflower, the Kasuri Methi, the garam masala, and another half cup of water. Add the paneer, and turn gently with a wooden spatula, so that they absorb the gravy. Cover and cook for about 10 minutes, or until the cauliflower are cooked though still crunchy. The gravy should be thick and moist. NOTE: Peas may be used instead of paneer. 1. Trim the cauliflower, discarding the leaves. Cut the stem, creating a flat base, so that the cauliflower will sit straight. Soak in salt water for 15-20 minutes to flush out any worms and insects. Drain and dry, and then deep fry in about 2 inches deep oil, turning it over carefully so that it browns on all sides. 2. In a pressure cooker, transfer a half cup of the oil in which you fried the cauliflower, and heat it. When it is very hot, add the hing, followed by the whole spices and the jeera. A few seconds later, add the tomato pureé and continue frying till the oil separates from the tomato. Now add the powdered spices and sugar, salt to taste and half a cup of water, and let it come to a boil. 3. Stand the cauliflower upright into the pressure cooker, sprinkle chopped coriander leaves over it, and add a cup of water. Replace the lid and pressure cook for 1 whistle, let it cool, and open it. 4. Make a solution of the cornflour and a little milk, and add it to the gravy, followed by a cup of milk. Stir to thicken the gravy somewhat while bringing it to a boil. 5. To serve, carefully transfer the cauliflower to a dish, and pour the gravy over it. Just before serving, streak the dish with cream and a sprinkle of garam masala (see recipe for Caulifornia). THE SEARCH FOR GNOCCHI IS OVER. It ended about two weeks ago, on page 512 of the Larousse Gastronomique. Silly of me not to have thought of it before, but I’m known for that sort of addle-patedness. In the meantime, over ten years had passed. The world had undergone radical transformations: empires had fallen, princes had been brought to their heels (but not their senses) by national scandals, the USSR had humbled itself but still been unable to improve upon its national soup, borsch. Here in India the famous Jain pizza had been perfected, with cholé topping and no garlic. Meanwhile, I had grown old and tired searching for the original gnocchi. I remembered very little about it except that it had ingredients that could turn greedy little pigs into gourmets: lots of cheese, bluggles of milk, globblops of butter, flour and such. In addition, I recalled effortlessly the rich brown aroma of the baking session that ended the cooking. The final dish, bubbling with hot butter, had little bits of pink sticking out through the molten cheese. What could it have been? And there was something green too. Whatever could that have been? I made gnocchi (meaning ‘lumps’ in Italian) first in 1982 in the house of an unsuspecting friend (who, since exiled to Russia, carefully avoids mentioning borsch in her despatches). I distinctly recall that the recipe did not come to me in a dream, but was laboriously copied from a book, and that too one not on Italian cuisine. There were perhaps 20 invitees to the party, and they thought ganochi, as they called it, was a specialty of Kathiawar. However, there was perfect silence, broken only by nutmeg burps, while they ate. I was an immodest hit, and was approached immediately by several eligible young women , who wanted to know if I thought a man’s place was in the kitchen. Two weeks ago, I was doing my morning exercises — lifting the Larousse Gastronomique 20 times, first with the left hand and then with the right — when it fell open to the page with the word quenelle, meaning dumpling in the area of the world called Alsace. As you know, I am fascinated by strange deja vû words. In quick succession, I discovered knödel, noque, knepfle, all meaning dumplings in various European languages. One thing led to another, and suddenly I found myself staring at an ancient 7-letter word starting with ‘g’. Small dumplings, read the description, made of flour, semolina, potato or choux pastry. My heart leaped. Gnocchi. At last. Three kinds of gnocchi are listed in the Gastronomique, and two of them may be safely kept aside. The one that we are concerned with is gnocchi á la romaine. Here’s how you could make an extremely high-calorie but unputdownable gnocchi dinner for four. It’s normally enough to serve it with a fresh, wet, green salad, perhaps with bits of celery or parsley. Pour 125 gms of white flour (maida) into 2 cups of boiling milk and stir it till you get a very smooth porridge. Add salt, pepper and grated nutmeg, some freshly ground black pepper, 1 cup grated Parmesan or Mozzarella cheese and 2 tablespoons butter, and blend into the paste. Allow it to cool and then add 1 lightly beaten egg and 1 yolk. You should have a fine paste in front of you. (If you include fresh spinach among the ingredients, the paste gets coloured a pleasant green). Spread this out on a large moistened slab and leave it under a fan till it is completely cool. Separately, prepare some Bechamel sauce — melt 3 tablespoons butter over low heat in a heavy saucepan. Add 6 tablespoons flour and stir briskly till the mixture is smoothly blended without the colour changing. Add 2 cups of milk and whisk with a wire whisk to prevent lumps forming. Season with a salt and freshly ground black pepper, and cook it slowly till it is medium thick. With a pastry cutter, or a knife, cut the cooled paste into rounds of squares. Arrange these in a buttered baking dish, with alternate layers of Bechamel sauce and ham. Sprinkle lots of cheese over the top, pour dollops of melted butter over it, and then brown it slowly in an oven. And by the way, it isn’t pronounced ganochi. It’s nyoki. I WAS A HUNGRY BACHELOR ONE SUNDAY EVENING IN DELHI. It was winter, bracing and very cold, when the stomach like to pretend it is celebrating its birthday and that everyone should be nice to it. I have always treated my stomach well, and am known to take some trouble to hunt down unusual delights to please my gastronomic machinery. Masala Manor was the name I had given to my humble terrace flat in South Extension, though no-one but I knew this. The kitchen was large and airy , and on its shelves were all manner of fresh spices, lovingly bought at the INA market, a mere autorickshaw’s throw away. Curds would be set plump and firm every day in an earthen vessel, and on special days, breakfast would consist of ajwain ka paratha, gobs of butter and pachranga pickles from Ludhiana. The day I invented the Mama Mia Dinner, I was, as usual, wondering when dinner would be served. And what it would be. And why on earth no aromas were about yet. Then I remembered — my amazing cook Chhotu had left on annual leave that morning. The conclusion was inescapable — I would have to make my own dinner. It was during the next few minutes of desperate introspection that I remembered the fuzzy outline of an Italian dish that I had read about in a cookbook long ago and far away. I had tried making the dish at someone’s house but, being young and clumsy, had failed miserably. Many people who ate it that evening then completely severed ties with me. Papaya, they told me, ought never to be deployed in an Italian salad. I have named the following trio of dishes the Mama Mia Dinner. It contains no papaya, will not affect your social life, and is designed specially for bachelors and other people who have a little time in the morning and hardly any in the evening. You have my word that it is colourful, unusual, very wholesome, full of open-sesame surprises and will make you feel warmly towards Italy. There are three parts to it: the cold soup; a fettucini entreé; and the tour de force — the salad. Let me run you through the the cold soup first: its ingredients are buttermilk, walnuts, lots of garlic, cucumber, sea salt, lemon and parsley. The walnuts, garlic and cucumber, the former crumbled and the latter two chopped, must be pureéd, being merged with buttermilk. Chill the ensemble after squeezing some lemon juice into it and adding salt. Throw in a sprig of parsley before serving. Being a bachelor, you must take the first few steps towards the Mama Mia entreé in the morning. You will need some large, purple aubergines (baingans). Slice them into circles, salt them liberally, and leave them in a shallow dish for about an hour. Being hygroscopic, the salt will draw the bitter water out of the vegetables. Pat them dry, and leave them in a warm place or out in the sun to dry. By evening, when you return home, they ought to be ready. Julienne the aubergines into strips about an inch long. Heat some cooking oil — it should be pretty damn hot. Throw in the aubergine and let it fry to a golden brown crispness. Keep aside. Cut as much ham, or salamis, as you want into strips. In a vessel, boil some fettucini (ribbon pasta; you can get it in most grocery stores). Don’t expect me to tell you how to do this, the packet carries instructions. Separately, cut ham or salami into small strips. I am somewhat primitive about this, and prefer to shred them with my bare hands. The entreé is done when you combine ham, aubergine crisps and fettucini in a bowl that has been lightly buttered. Sprinkle some freshly ground black pepper. The final dish will be a pleasing, robust combination of pink, light cream, deep purple and golden brown. The salad — cube the following ingredients: apples, peaches, cucumber and Gouda table cheese. Shred some capsicum. No papayas. Toss the lot together, with a little salt. Now do some magic — take some sesame seeds (white til, the sort used in til laddus). In a tablespoonful of oil, fry them till they begin to turn golden. Toss them over the salad — and know that you have done something few have done before. If you have wine, bring it out — red is usually appropriate. Being a bachelor, light a candle, sit all by yourself, eat contentedly, feeding the dog a bit now and then. When the meal is over, lean back, release an Italian-type belch and ask yourself if “Mama Mia!” does not somehow seem like the best way to express your feelings. It’s all connected with pattern recognition. For instance, you can tell the difference between a pizza and an uthappam without straining your corpus callosum. One is based on dough, the other has batter; there’s wonderful melted cheese on one, but if the other has cheese, it’s a fake, there’s stuff under the cheese in one, there’s chopped onions on the other. One is baked, the other is fried. Once you understand the pattern, you’re on firm ground. You know that only someone living in the suburbs of Bombay would eat an uthappam and pay for a pizza, and not feel like a yap. But take the wonderful south Indian concoction called rasam, and suddenly you will be in a tamarind quagmire, where rules collapse unpredictably and identities change casually, so that even if you know where rasam begins, you’d be a genius to know where it ends. Rasam, for those new to the concept, means juice, and in this case, it refers to the juice of the tamarind, on which any self-respecting rasam is based. Or ought to be, at any rate. The thing is, there’s simply no telling with rasam. You may suddenly stumble, in a later paragraph, on a rasam that has eschewed tamarind but has not been disowned. Or one that has no dal and yet fits into the family. Or, scandal of scandals, one that has no rasam powder but also no identity crisis. Rasams, more in kind and number than I could count on the fingers of a hand, were a standard part of childhood, coming usually with tales from the Panchatantra. The ingredients were a mother, a storybook, and a plate of steaming rice. Rice would be mashed by mother’s fist with boiled tuvar dal laced with aromatic clarified butter and a touch of salt. A little hill would be made, a valley bored down from the peak, and hot rasam poured into it, coriander leaves trailing. The children would get their fists into the meal, while the Panchatantra whispered. Later we learnt that some of the distinctive flavour of the rasam came from the alloy of the vessel in which it was prepared. Iyam, them called it. No one uses iyam vessels very much any more, ever since they found out they contain lethal lead, but in my humble opinion rasam doesn’t need help from alloy or compound. You will now remind me, and rightly, of pattern recognition, where all this began. How does one, you ask, recognise rasam without losing one’s sense of well-being? Not possible, in my humble view. You could say that it’s rasam if it contains tamarind but then so does sambar, and that isn’t rasam. Well, you argue on bravely though foolishly, then let’s say it should have tuvar dal too. No good. You’re still in sambar territory. So add rasam powder, you say, taking the cheap and easy way out. But even there rasam slips away: the Unsuspected Pepper Rasam is made without rasam powder. For that matter, the Hardly Known Gottu Rasam is made without tuvar dal; and the Amazing Lemon Rasam is made without tamarind. To top it all, the Splendiferous Paneer Rasam, which has nothing to do with cottage cheese is served exclusively at weddings, is made of rose petals. Now dry roast 4 tbsp coriander seeds, 2 tbsp channa ka daal, and 2 tbsp urad dal, till the urad turns golden. Finally, dry roast 1 tbsp tuvar dal, 1 tbsp whole black pepper, and 1 tbsp cummin seeds, till the black pepper begins crackling with excitement. Generic rasam: To make this, cook a cup of tuvar dal to a mellow softness with a little turmeric powder and salt. Soak a lemon-sized ball of tamarind in 2 cups of lukewarm water, and then, with your own clean hands, squeeze out the juice and discard the pulp. Add 1 tomato chopped large, 2 tsps rasam powder, 1/2 tsp turmeric powder and 2 springs of curry leaves to the tamarind water, and boil till the level comes down by about a 1/4″. Pour a cup of cold water to the tuvar dal, and add this to the tamarind water. You should have soaked a little bit of LG’s asafoetida in water an hour earlier. Add about a teaspoonful of this to the pot, and heat it over a medium flame. Remove it just before it comes to a boil. Garnish with fried mustard seeds and fresh coriander. Pepper rasam: All steps as in Generic Rasam, except that you leave out the rasam powder entirely. Instead dissolve 1.5 tsps black pepper powder, 1.5 tsps sugar and 1 tsp red chilly powder in a 2 tbsps of water, and add it before bringing to a boil at the end. Lemon rasam: No tamarind. Instead, in 2 cups of water, boil 1 large chopped tomato, several pieces of sliced ginger, several halved green chillies, and 2 tsps rasam powder. Rest as ;in Generic Rasam. Curry leaves instead of coriander as garnish. Paneer rasam: Make the Generic Rasam, but let it stand for a while and separate the thin liquid that stay on top. Add 2 tbsp of rosewater, and a few petals of the Edward Rose. No asafoetida, please, there are ladies in the room. Eat like a child. Use your hands, home-made clarified butter, and make sure you spend a long time mashing rice, ghee and tuvar dal together before adding the rasam. And enjoy the Panchatantra. WITHIN TWO HOURS OF REACHING CAIRO, I was tucking into a hearty Messianic breakfast with a faintly self-congratulatory smile on my face. CYG, I said to myself, you old goat if only your friends could see you now. Eating feta cheese with olives. And Ramses knows what else. Having a regular international experience, you are. The fare consisted of items that you yourself will possibly have encountered in the Bible and Lawrence Durrell. Yoghurt with honey. Goat’s milk cheese with black olives. The flat, round unleavened bread called pita. Fried egg with some thin slices of Egyptian bastirma, their version of pastrami. Turkish coffee in those cute, fist-sized demi-tasses — exotic but, by Osiris, wait till you get to the grinds at the bottom of the cup. What a choke. I mention all this so that you may know what is not the real thing. This is merely a 5 star caricature of Egyptian food. And it costs a Pharaoh’s ransom — 16 Egyptian pounds (about Rs.106). My search continued, now on the streets of Cairo, downtown Cairo, where life is a good deal more uncertain, and the flavours and aromas in the air far less familiar or identifiable. I found myself a room in an old, but spick and characterful hotel called Windsor, which grew in a bylane not far from Tahrir Square, the heart of town. In the small teahouse across the lane, as evening dawns smoky and warm, Egyptians men convene on chairs outside, and play rounds of the dice game called tawala, punctuated by many many cups of dark kahwa (coffee) and puffs at hookahs. Well, this felt like more like North Africa, all right. But where was the food? The food, it turned out, was in the humble home of one Omar Ehlwe, who mainly drives a taxi around Cairo. As far as I am concerned, his pretty wife, Mrs. Ehlwe, knows exactly how to treat a chicken. Omar, 25, comes from a reasonably well-off Cairo family. I stumbled into him at his little bookshop on the promenade along the Nile River, and after that, we were inseparable. We went all over the city in his beat up old Toyota taxi, listening to his beat-up Egyptian pop music cassettes. Omar symbolises the best of his country’s hospitality, the non-touristy, non-huckstering kind. So it was without any misapprehension that I made bold to invite myself over to his house for a meal. He considered. “There is only one way to find out,” he said. “I accept,” I said graciously. We drove up to his house, which stands almost in the shadow of the Sphinx and the three great pyramids of Gizeh. His house, gloomy but roomy, contained an extraordinary number of ancient, gorgeous, brocade-covered sofas. Sitting on one of these, I awaited a common but typical Egyptian meal. But what finally reached the table was one of those masterpieces, whose excellence lies in their utter simplicity, style and charisma. There are three players in the Ehlwe Symphony, and the simplest is a salad assembled from diced tomatoes, cucumber, conchiglione (shell pasta), parsley, with lemon juice and salt. Make this rightaway and tuck it away in your fridge. Meanwhile, rub salt all over the fowl, and leave it to tenderise for about half an hour. The third instrument in the opus is the small, round and purple aubergine that the Egyptians called betingan. The piece de resistance. . Preparing this is simplicity itself — take about 12 aubergines (to feed about four) and make a single horizontal slit three-quarters of the way along each, so that it appears to have a mouth. Now deep-fry the aubergine in very hot oil till it becomes soft but not pulpy, and turns a golden brown inside the mouth. Leave them on kitchen towels to drain the oil, and then cool them awhile in the fridge. While this happens, prepare a pureé a equal parts raw garlic, hot green chillies, some salt and some lemon juice. Spoon a bit of this into the ‘mouth’ of each aubergine. It was from Omar, later, that I received an account of how Mrs. Ehlwe addressed the chicken in her kitchen. She deep-fried the fowl in oil that had been spiced — with cinnamon, cloves, cardamoms, bay leaves, mace, whole black pepper, things like that. By the time the chicken turns golden brown, it has absorbed the subtle fragrances of all those spices. Leave this part for the last, so that the chicken is served hot. Well, I have put that meal on my tongue, and I can tell you I now know what Messianic really means. When betingan joins that succulent, subtly spiced chicken, an extraordinary duet begins. The aubergine with its spicy filling lands on your tongue like an Ottoman warrior, full of energy, fire and piquancy. The bland chicken suddenly meets its mate, and a remarkable pas de deux is set up, with each dish highlighting the other. Throw in a spoonful of the juicy salad after it, and the aria will be complete. VAISHALI MAKES BETTER DAHI VADAS than the Jaipur’s Lakshmi Mishtan Bhandar. But her mother-in-law, Sushil Jolly, makes even better dahi vadas than her and Vaishali is the first one to admit it. In fact, when she weighs mother against mother-in-law, there is no confusion in her mind about who is the dahi vada queen. However, Vaishali’s mother-in-law’s mother, Shanti Oberoi, makes the best dahi vadas of them all. It is possible that she makes the best dahi vadas in the whole world. I’ve never eaten them, but I have always known instinctively that there is a dominant gene in most Punjabi women that enables them to construct superlative dahi vadas. Punjabi men, I suspect, have a gene that makes them physiologically incapable of refusing to eat dahi vadas once they have been constructed. This explains the success of a street such as Delhi’s Ajmal Khan Road. I myself ate the best dahi vadas in the world in 1970-something, when I was sent to Jaipur, and stayed at a hotel called Lakshmi Mishtan Bhandar. Despite the oleaginous name, the establishment is a landmark of the pink city. It stands like an old and tattered monarch, surrounded by monkeys and enormous Rajasthani doormen. A halvai sits outside the lobby making phirni and samosas in pure ghee that flavours the entire street. On the ground floor there is also a pure vegetarian restaurant where these dahi vadas — or bhallé — as they are called, are served. You get about 6 to 8 on a plate. But they have bits of cashew inside, dear friends. And I know now that Vaishali might disapprove of that. Sushil Jolly might look pained, and Shanti Oberoi might faint with horror. Indeed Punjab might go into a deep depression. Vaishali has learnt her craft from the custodians of tradition. I ate nothing else at her house where she’d made the rest of the dinner as well, and I marvelled deeply at what one must do to get such a wonderfully spongy creation at the end. Why are some women doomed to make worse dahi vadas than the rest? I thought I should ask Vaishali this question. Vaishali said that she was the first doomed woman, because her mother, mother-in-law and her mother in turn were all perhaps better at it than she was. Next, without fuss or bother, she got into nitty gritty details. The trick, according to V, is that you have to beat the vada batter. Not like a disciplinarian but more like a sports coach. The batter is made without fuss: you leave urad dal and mung dal (three parts of one to one part of the other) to soak overnight, and then bung them into a mixie to grind in the morning. The spicing (salt, coarsely ground peppercorns, hing, cummin seed or jeera) are added separately. At least that’s how Vaishali does it. She now uses a spoon to ‘beat’ the mixture till it is the desired consistency. Her mother-in-law’s mother, swears Vaishali, doesn’t use a spoon to mix the blend. She moves her fingers in the batter, processing the vada batter till it is smooth and ready to fly. At this point, if you take a drop of the batter and throw it into some cold water, it should float. If it doesn’t, you may be sinking. Now heat some oil and make the vadas. Take the trouble to roll them by hand separately first, so that you get reasonably round vadas, and for God’s sake, don’t roast them golden brown, you are not an Udipi restaurant are you. Now, next, soak the vadas in hot water for about 10 minutes. Then squeeze out the excess water, taking care not to break or distort the vada in the process. Toss it into fresh curds into which you have already added salt, black salt (very important!! If you want to be real), jeera, black pepper power and red chilly powder. For a while. Your untutored palate might feel something amiss, and it will be right. The chutney is absent. And here might be the solution. To get it right, you need to take a little aamchoor and sugar and mix them in the ratio of 3:1. Mix the aamchoor in a little water, add the sugar, boil it, with the judicious addition of salt, black salt, cummin, coriander powder and so on. Anything to take it closer to God. Pour this stuff over that stuff, and you have dahi vada, Version Vaishali. Of course it’s all right, silly. We’re just waiting for dinner now. The 25-year-old chef was wearing his deadpan face, the one he used when he had done some devilry in his kitchen. The pudding looked perfectly ordinary: I stirred it, noted some blanched almonds floating in it. It tasted as it should, touch of crocus there. There was something wrong with the way the almonds tasted, though. There was a tantalising edge to them, too subtle to identify but too distinct to miss. “What’s this?” I asked Ishtiyaque, holding an almond up in a spoon. And that was how I had my first ever garlic pudding, over six years ago at the end of a memorable dinner at the erstwhile Dum Pukht restaurant of the Searock Hotel. The man who had subdued the garlic enough to make it sing within milk comes from a rich culinary heritage in the nawabi gullies of Lucknow. Now in a Lucknowi gully, the cook of calibre is one who can dissolve the maximum sugar into his rice. “Some people can manage just a kilo of sugar to a kilo of rice,” said Ishtiyaque. “A champion could do upto three.” I must have looked blank, because Imtiaz kindly began to explain. To cook correctly, with each grain standing separate, a portion of rice needs a portion of water. Accommodating more sugar, however, means adding more water, and thus increasing cooking time — and risking the rice being reduced to mush. In Lukcnow’s gullies, the man who can melt sugar into his rice without turning it into goo is hailed as a virtuoso. Last week, when I reached the Leela Kempinski Hotel, where Ishtiyaque’s vast innovative skills are utilised (or underutilised), Ishtiyaque was doing something with rice. I recognised it at once — the mythical Syrian Christian Coconut, which I had extolled in this very column a fortnight earlier. A dish I have heard described but never seen being prepared, this enticing coconut dessert is said to be made after the Kerala rice harvest, when the grain is parboiled in large stone vats in the backyards of landowning Syrian Christian households. While the rice parboils, fresh green coconuts stuffed with a mixture of flat rice, jaggery, cardamom, cumin and ghee are bundled in cloth and thrown in to cook in the water’s heat. “The principle involved is the same as in Lucknow’s dum cooking,” said Ishtiyaque. “That’s why I decided to try it.” To simulate the environment of a Syrian Christian stone vat in a 5-star kitchen, he added rice to the water. To better seal in the coconut, he plastered the shell with wheat dough, the way a handi is sealed in dum cooking. The result, when he finally dismantled the coconut, was a superbly subtle sweet in which the cumin stood up unexpectedly within mouthfuls. After a particularly dazzling dinner once at the Leela’s Indian Harvest, whose menu he has slowly refashioned, he asked me if I could guess why the gulab jamun was called as such, when it featured neither jamuns (blackberries) nor gulabs (roses). After being rewarded with a vacant look from me, he served us the original gulab jamun. The syrup, dark, thick, slightly sour and fragrant, had been brewed from the juice of true jamuns mixed with honey, and charmed by the juice of fresh rose petals. Another Ishtiyaque original. Last week, for the first time in all the years I’ve been fed by Ishtiyaque, I asked him to cook something perfectly ordinary, something he hadn’t invented, something anyone could cook, something typically Lucknowi and something delectable. He easily created the Bawari Handi. A bawar, in old Lucknow referred to the fertile banks by a river. When a crop of fresh vegetables reached the market from a bawar, you could savour the Bawari Handi in hundreds of Lucknowi dhabas. While Ishtiyaque watched his Bawari Handi, I watched him. Like a Zen archer, who closes his eyes and blanks his mind at the moment of aiming, Ishtiyaque when cooking seems to become one with his creation. Here, at age 30, with his distinctive pigtail of hair behind his toque, was a consummate chef with supreme control over his ingredients, their quantities and their behaviour. His hands, unexpectedly podgy even in a charitable description, work like calipers, precisely assessing quantities of turmeric, chilly powder and salt, the only three spices in this dish. As the mutton simmers cheerfully in its own juices, you will come to believe that the meat has indeed met its master, and will obediently do as he bids it. At the height of creation, the cook disappears in sheer pleasure. The mutton and vegetables start enjoying their own transcendence to heavenly status. Cooking, for a while, stops being a task with an objective — and at the end, the Bawari Handi seems to emerge almost by itself, perfect in every nuance, its wafting aromas heralding its birth.